Those technologies typically are part of bigger systems that offer more than just obstacle detection and collision avoidance. No doubt, the biggest selling point for all of them is lives saved, followed by damage and disruption reduction and increased efficiency. Current headlines reveal the growing popularity of the technologies and systems, which are ever-evolving into component parts of broader, more comprehensive, equipment-brand-agnostic autonomous mining solutions. PRECO Electronics announced in February it received a record number of nominations for the annual Excellence in Safety award. The award honors individuals “for their initiative and commitment to the advancement of safety.” Advancing safety is at the core of the company’s mission and offerings, and the upswell in nominees points to a market trend that bodes well for the company. “As people recognize active warning systems save lives, integration and implementation of this technology is becoming commonplace,” said Tom Loutzenheiser, vice president, business development, PRECO. Already, the trend is toward incremental adoption of automation solutions targeting safety, he said. “What seems to be occurring is rather than having mines with no automation or mines that are fully autonomous, mines are emerging more often with Level 1 automation,” Loutzenheiser said. With Level 1 automation solutions, the operator is in control of the rig, but is assisted when sensors detect obstacles or other dangers. At Level 2, when an obstacle is detected, a control system intervenes and takes action, such as evasive steering. Level 1 capabilities are currently the most widely adopted, Loutzenheiser said. “The most relevant safety feature to the industry is active braking,” he said. “This feature is used mainly for backing.” Similar solutions in this space are often pitched as both machine awareness and situational awareness offerings. PRECO offers several either within or complementing its flagship Automotive Driver Assistance Systems or ADAS. One example of a solution designed to be part of an ADAS system, but capable of stand-alone operation, is PreView Sentry. It can be deployed to a shovel to prevent it from dinging haul trucks. Preview Sentry leverages a radar and requires no additional software or hardware. “The system includes sensors, cable, and the operator interface, all configured to work together as a system,” Loutzenheiser said. “They could build a primary awareness system for a shovel using multiple radars and our new display.” The idea is to put “the operator in a near 360° cocoon of safety,” he said. On a shovel, Sentry alerts the operator if the swing of the shovel will hit an object. “This functionality would not be different on an autonomous hauler because the radar still detects objects and sends a signal to the vehicle from the loader,” Loutzenheiser said. “Integrated with ADAS, the system can prevent, for example, an operator from turning an excavator if there is a risk of collision.” Many drivers quickly adapt to operating rigs equipped with ADAS and other PRECO safety solutions, the company reported, and come to appreciate the added convenience and safety. They see it as protecting them from other drivers’ mistakes, not their own. “Although the ADAS features that take over operation of the vehicle to avoid accidents are still quite controversial, its adaptive speed control, night vision and blind spot monitoring capabilities are more widely accepted,” Loutzenheiser said. ADAS systems are used in mine sites around the world and have more recently seen an uptick in interest from sites in South Africa, where new legislation mandates automated safety solutions on large equipment. For example, “we have done a lot of ADAS with operational machinery in the Sishen mine located in central South Africa in Kathu, Northern Cape,” Loutzenheiser said. Sishen, with some of the largest iron ore reserves in the country, originally sought an active braking system for Kumba’s haul trucks. It ultimately adopted some PRECO solutions as part of a bigger strategy to improve mine site safety in general. Hexagon Mining reported two capabilities within MineOperate Pro OP help coordinate the tasks of shovels, trucks and dozers to increase productivity and reduce safety risks. High- and low-precision shovels and dozers can leverage the onboard software and that of a centralized server, Hexagon’s Fleet Management System (FMS), to coordinate cleanup at the loading site. The flipside of the coin is a capability that coordinates trucks and dozers at the dump site. 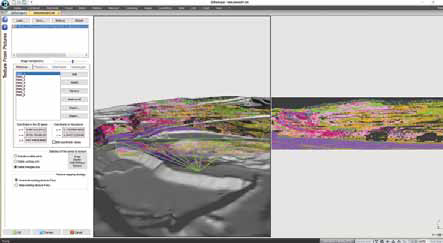 Data from a hyperspectral imaging scanner is used to overlay a mine model with ore chemistry information. Contrast that with the more traditional methods. “Cleaning up is a common task and relies on radio communication,” Romero said. “Usually, the radio channels are busy and don’t give enough time for people to coordinate.” The onboard software, MineOperate OP Pro, which runs the cleanup functionality, “is configurable,” Romero said, and it “communicates with FMS, which “facilitates the communication between equipment and keeps records of the communications.” Assignments are queried and accepted using onboard FMS panels. If the loading area needs to be cleaned, either the shovel or the dozer operator can query the other for cleanup task execution. “The operator uses the panel for this request,” Romero said. Both the onboard software and FMS are equipment brand agnostic. “Hexagon is committed to offering integrated solutions,” Romero said. “We know there are a lot of isolated onboard solutions that struggle to share data between equipment.” Integrated solutions further two company missions, he said. “What we are doing here makes the process safe and productive,” Romero said. Separately, Hexagon Mining reported some of the research it is conducting in partnership with the University of Arizona into hyperspectral imaging-based solutions could have machine vision and situational awareness applications. Geospatial, Hexagon’s GIS-leveraging open-pit mine planning platform, can assimilate hyperspectral data. In the future, it could process data from scanners mounted on heavy equipment or suspended over haul roads. “These sensors can be processed really quickly on board,” Lyons-Baral said. “Some of these are used in plants already,” he said. “It is actually being run on belts.” It could also be mounted to a shovel, he said. “It can have an alerting system and a routing system put in.” One possible application would be to have “FMS and our autonomous systems use it actively, saying, oops, that is not what you thought it was,” Lyons-Baral said. “There are different places it could be positioned,” he said. “It is going to depend on the mines, the methods, and what makes sense for them, where they need it to measure.” More research willl be done soon. Komatsu subsidiary Modular Mining Systems reported its ProVision Guided Spotting System can in some cases increase shovel productivity by more than a third. The system, announced last month at the Society for Mining Metallurgy & Exploration’s annual conference in Denver (SME), provides situational awareness to hauler operators trying to back into place at the shovel. It was developed to nix the procedural shortcomings common to the task, Braden Weisheit, global sales manager, machine guidance, Modular Mining Systems, told E&MJ. “Traditionally, mines utilize inefficient practices such as bucket spotting and single-side loading, which reduce the productivity of shovels and trucks,” he said. Two in-cab LED displays provide the information to the operator. When the hauler approaches the shovel, the displays present detailed guidance. The guidance is based on the specs of a “load zone polygon” at the shovel, Weisheit said during a presentation at SME. When the truck breaches the polygon, instructions on maneuvering into the optimal “spot” are generated, he said. “The shovel operator has to set the spot point on each side when they are setting up their position,” Weisheit said. “The spot will stay with the shovel for a short amount of time in terms of movement, so there is some leeway given to the shovel to move within that space around some predefined characteristics,” he said. “Today, from a safety standpoint, we eliminate a spot automatically if the shovel was to breach either one of those loading zones as it moves, in which case it prompts the operator to reset that spot on either side.” The primary tangible deliverable of the system is exact “continuous guidance and navigation information,” Weisheit said. The benefits are numerous and “include reducing shovel hang time, eliminating re-spotting of a truck, and facilitating double-side loading,” he said. The system allows the miner to optimize shovel swing angle and load cycle, and to maximize trucking capacity by minimizing total truck wait time. Results include improved compliance to plans along with potentially big gains in productivity, the company reported. In some cases, it can contribute up to eight additional loads per hour. “Dynamically providing truck operators with guidance to the optimum load location without the need for shovel bucket spotting support can increase shovel productivity by up to 34%,” Weisheit said. In deployments this year, the system could be used to guide hauler operators dumping at the crusher site. “Because it is a static, fixed dumping point, it is just a matter of surveying in that dump spot,” he said. “Once the truck breaches that polygon around the dump point, they receive guidance to get to the exact designated spot.” Beyond 2019, the system could be deployed in other applications, Weisheit said. “When we look down the road a little bit further, we’re seeing dozer spotting and getting into some of the autonomous technologies, running a manned and an unmanned fleet together, with paddock dumping and planned dumping, and lane guidance and keeping, with that high precision data being captured on the truck throughout the mine wherever they are at,” he said. Epiroc’s Underground Traffic Management System (TMS) is scheduled for release in Q2 2019. The system features, among other things, an advanced algorithm capable of coordinating a fleet of underground loaders, with a big chunk of the needed computing and processing done on board. TMS is the product of a partnership that at the time it was announced appeared ambitious in scope and novel in the players involved. It has since proven to be a mere taste of things to come for both Epiroc and the sector in general. In October 2017, Atlas Copco, the forerunner of Epiroc, announced it was joining with defense contractor Saab and tech firm Combitech to develop safe mining and digitalization solutions. The collaboration included digitalization efforts related to mining control tower, cyber security and ecosystem solutions. The net result, Epiroc reported, is possible production optimization. “Normally you load from the system into a crusher or onto a conveyor,” Pettersson said. “Those type processes like to have a steady flow of material,” he said. “If we can have this optimized and really focus on that to make sure you discharge the material at a constant pace, that process will be even more effective.” TMS could enter the market as “one of our big upgrades,” enabling the company to “market it a little bit more widely,” Pettersson said. Currently, it is being marketed to select clients. It is best suited for a mine running loaders or trucks on repetitive tasks. It is also best suited for a miner willing to partner on a project, adopt the requisite communications infrastructure, and follow the required adoptive process. Pettersson said he expects TMS to deliver “big benefits” for customers. He said he also expects its release will sync with the other headlines coming out of Stockholm. “We are stepping up one level from being just a machine and assistance supplier to being something a little bit more than that,” he said. An automation package for Sandvik DD422i and DD422iE drill rigs will be released as an upgrade as early as H2 2019, the company reported. The package will be available for both new and already deployed drills. The package offers three capabilities: boom collision avoidance, semiautomated drill bit changeouts, and teleremote drilling controls. Each can be adopted separately. 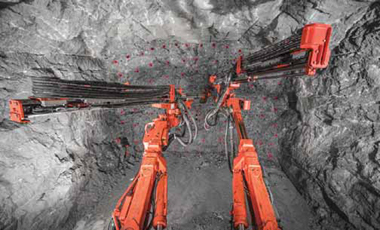 The offering is “all about enhancing the reliability of drilling automation and improving both safety and ergonomics for the operators,” Johannes Välivaara, product manager, underground development drills, Sandvik, said. Another hurdle was building an onboard system powerful enough to field the required computing and processing tasks. “The dynamic route calculation algorithms are fairly complex to run and they require quite a bit of power from the system hardware,” Välivaara said. “It’s all about measuring continuously and on a high-speed frequency the readings from the sensors to determine the current location of the boom, rock drill and drill bit, and to utilize the data to make higher-level strategic decisions.” The boom collision-avoidance system is based on a dynamic route recalculation model that, among other things, predicts potential collisions. It then acts to avoid those collisions by re-routing the boom movement from hole to hole. As a last line of defense, if the booms get too close to each other, the movement will be stopped. One important result is a net reduction in the amount of manual work in the drilling process. The semiautomated drill bit changer can contribute to that reduction. “As well as enhancing productivity, it reduces the risk of personnel exposure to weak ground conditions, such as at the face itself, and also the need to get in and out of the operator cab, which is one of the main causes for various ankle and knee injuries within the underground mining industry,” Välivaara said. The system allows the task to be executed in a safe location. “It consists of racks of drill bits, six or nine standard bits plus a reaming bit, for both booms,” Välivaara said. “The principle is simply to remove the old bit and then retrieve a new one,” he said. “The system positions the boom automatically next to the rack from where the operator can then manually release the worn bit and retrieve a new one.” The system uses the same sensors as those leveraged by the boom collision- avoidance system, meaning it requires no hardware in addition to what is already built into the drills. Onboard componentry consists of cameras, a safety-rated laser, scanners for area isolation, wireless antenna, and a control logic. 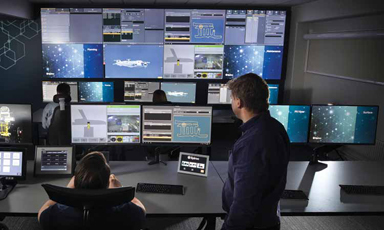 Off-board components include the remote-control station, viewing screen for cameras located on the unit, and some auxiliary controls for both lights and cameras. Adoption requires a Wi-Fi network with a minimum of 10 megabits-per-second bandwidth in the mine, Välivaara said. “The package is light and compact, allowing the control station to be easily moved from one place to another,” he said. The system allows remote supervision of the drilling automation, and, where needed, operator assistance in drilling holes in challenging locations. “Also, the drill bit change can be done by remote by utilizing the teleremote drilling controls combined with the semiautomatic drill bit changer,” Välivaara said. The ideal customer for the package is a miner with robust experience operating underground development drills that is interested in systematic automation, he said. Nonetheless, “anyone interested in reducing operator exposure to the headings, and particularly in the front area of the drill, would be able to see the benefits of what this package can deliver,” Välivaara said.